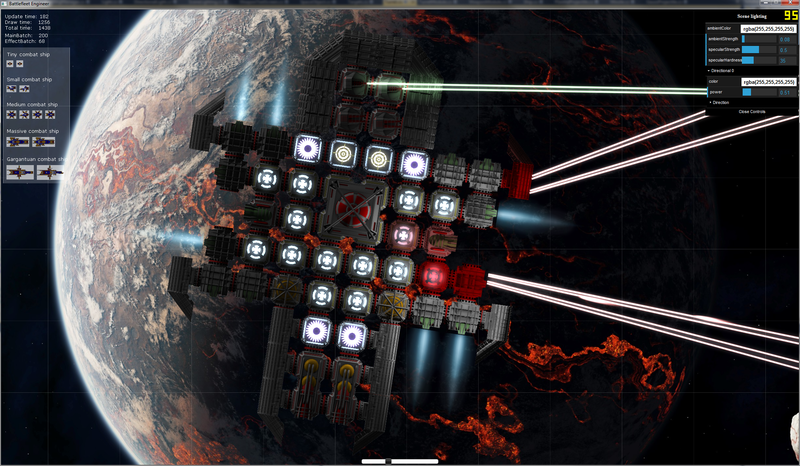 When I first started the developing the main concepts of this game, there weren't pretty much any other games with such focus on the modular ship design and physics-driven gameplay. My initial inspiration came from the legendary Battleships Forever. However, now it seems that there will be a relatively huge rush of space-related indie games in the near future, and some of them have quite similar ideas. This means that I will inevitably have competition from games like BossConstructor, Wayward Terran Frontier, Blockship wars, Reassembly, Space Engineers, Battleship Commander etc. and I can't beat them to the market either. This forces me to think hard about what features I really want to focus on, and aim to provide something that none of the "competitors" offer. Overall this will be quite beneficial, as having a clear vision will usually lead to much higher quality end product, even if it doesn't have as many features overall. I have given this some thought, and currently I feel that I can shine and deliver on the area of relatively large scale tactical fleet combat with extremely customisable ships. All of the similar games I know of seem to have a hero-player centric design where you build and control a single ship directly, and maybe have some AI-driven allies that you can give simple orders to. What I will aim for is to create a deep and involved tactical combat experience, where you will want to pause the game regularly to assess the situation carefully, and to give precise commands at fleet, ship and module group action levels to outwit the enemy for the best possible outcome in your favor. The goal can be obtaining the highscore on challenge scenarios, or to keep your persistent fleet alive and effective in survival or sandbox campaign modes. The combat will be brutal, with capital ship weapons capable of one-shotting small ships, so you will need to be on the edge. Casual players may primarily want to utilize ready-made ships provided either with the game or shared by other players. They may change weapons and upgrade the ships but probably enjoy more of setting up sandbox battles, watching them, and flying a ship that can blow up multiple enemies with relative ease provided by a low combat difficulty setting. Intermediate players will design their own ships and like to compare them to other designs available. They will understand the strengths and weaknesses of weapon types, and build fleets from ships that can support eachother in battles. In battle, an intermediate player will use multiple tactics such as flanking and luring their enemies. If flying solo or with a single primary ship in their fleet, they likely micromanage the weapons and maneuver the ship effectively to gain an advantage. Sharing designs and various achievements either in-game or elsewhere can be very important for some of these players. Advanced players know the effects of all available modules, inner workings of the AI, and how to exploit these for maximum effectiveness, possibly finding game-breaking combinations. Their ships and fleets may be specialised for obtaining highscores on specific challenge battles. They like to experiment with different ship design styles and fleet combinations, with some of their designs made not only for effectiveness, but aesthetics as well. For best possible results from battles, these players will often micromanage nearly all ships in their fleets, and can obtain heroic victories on the highest difficulty settings. The first partial week is actually already gone, and some progress has been made. This month will be a somewhat mixed bag of smaller things tha build up for some very interesting thresholds such as finally having actual battles with different fleets. At then end of September when I got the ships actually moving and firing weapons, I noticed that the performance isn't at the expected level yet. Namely, the resource system seems to be taking way too long to do its per-frame update on large ships that can have 200 or more resource users. 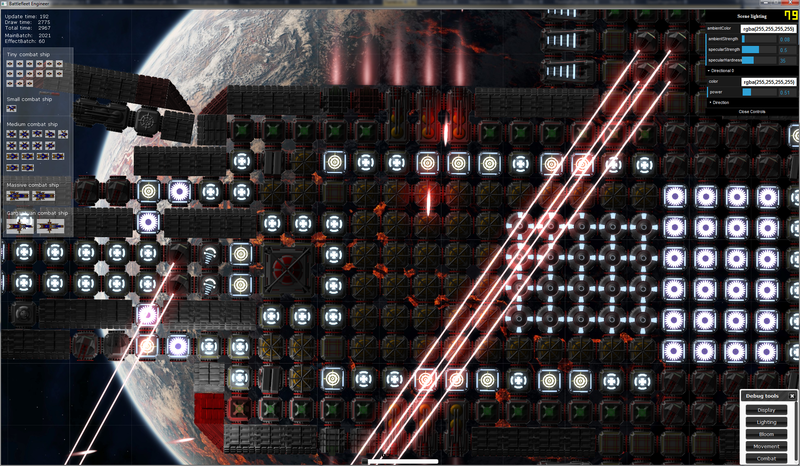 While the ships' update cycle is run in parallel, having a very slow ship update can force the game to wait before continuing on other work which slows the framerate. Here is a list of things I will try to touch during this month, but might not be able to get to all of them. Preserve certain amount of electricity for movement, shields etc. Calculate targeting point (lead) for targets and display to player?